In Punjabi: Uth Moya Kam te nahi jana? BLUE be the SKY above you. I wish all the HAPPINESS surround U. Everyone has their own someone. Everyone has their own special one. But u r someone who is always a special one to everyone. Gud Morning. 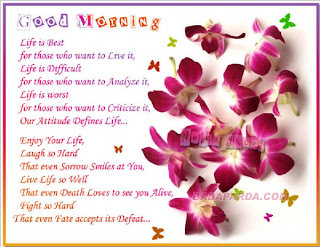 But friendship is a beautiful rose with love in every fold..
Good Morning and hav a gr8 day!
" The minute you think of giving up any relation, think of the reason why you held it so long " Gud morning and have a nice day.. Nothing is permanent in this world, not even our troubles.- Charlie chaplin. So, keep on enjoying the LIFE. Good Morning. Everybody is searching a chance to impress others but they don't understand that impressions are done by very casual happenings! Good morning. Let everyday b a dream u can touch. Let everyday b a luv u can feel. Let everyday b a reason to live bcoz life indeed is beautiful. Have a Gud day. but people like you travel in hearts. luv n hope that some day we'll get what we luv or luv what we hv! That’s life. Hv a nice day! So, hope for the best. Good Day & Good Luck! Through each day our goal is to touch one's heart; encourage one's mind & inspire one's soul. May u continually b blessed & b a blessing to others! Gud Day! Keep Correcting your Little Mistakes!.. Because Nobody Slip's down by Hills..!! But just Slip's by Little Stones..!! Seeing u smile is more than enough to pay for all the hardships & difficulties that I have to go through that day. Have a good smiley day! If everything in life is happening as u wish, you are lucky. If not, you r very lucky because things are happening as per God's wish..! Good morning..
All mornings are like Paintings. U need a little inspiration to get going, a little smile to brighten up & SMS from someone like me to color ur day. The sun had rised from the east & birds r singing happily & butterflies R around the flowers. It is time to wake up & give a big yawning & say good morning to u..
Winning Horse dsnt know why it Runs in Race. What is thedifference between ur smile and my smile? You smile when u feel happy and I smile when i see you happy.. So Keep smiling. 2day 2morow & Everyday 2 u !! Life never seems to be the way we want it, but we live it the best way we can. All Powers Is Within You . You Can Do Anything And Everything . Believe In That. LOVE + HAPPINESS + PEACE OF MIND and told me 2 share them with PPL Dear 2 me. I'm sharing all with U... Good Morning! A moment of patience in a moment of anger can help you avoid a thousand moments of sorrow. 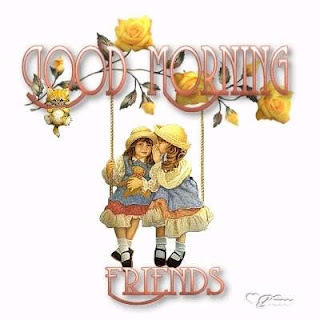 Receive my simple gift of 'GOOD MORNING' wrapped with sincerity, tied with care and sealed with a prayer to keep u safe and happy all day long! "Write Your Sad Times In Water..
Write Your Good Times In Stone"..
"The tree does not withdraw its shade from the woodcutter. So forgive the one who hurt you. They will realize ur worth one day". Good Morning n have nice day. Ur aim in life should be "54321O"